On April 21st, Google officially rolled out their “mobile-friendly update”. This is an update to their search engine algorithm that affects searches made on mobile phones. From now on, mobile-friendly pages will rank higher on mobile search results. Which means that if a site isn’t mobile-friendly, it will most likely start seeing a significant drop in visitors. This new update is expected to affect a significant portion of the web. According to npr.org, a study done by online Internet marketing firm Portent found that a majority of the web’s top sites aren’t mobile friendly. This has led to fears of a “mobilegeddon”. If the cries of “mobilegeddon” seem overblown, consider this: “in 2011, a major Google algorithm change designed to promote high-quality content sent some companies into financial ruin” (source: CNN Money). This is because many online retail sites depend heavily on Google for traffic and a drop in search engine ranking can lead to a significant drop in sales. The Google algorithm update may hurt a lot of companies in the short term. However, this is a necessary change, and it will benefit the entire internet community in the long term. The change is intended to make it easier for people searching on smartphones to find sites “where text is readable without tapping or zooming, tap targets are spaced appropriately, and the page avoids unplayable content or horizontal scrolling”. Smartphone users are no longer just a fringe population. They make up a majority of e-commerce traffic and it’s time to take them seriously. 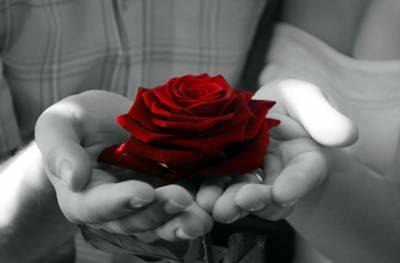 Treat them with respect and you will benefit, else your competitor will. Take this Google update as a much-needed wake-up call. 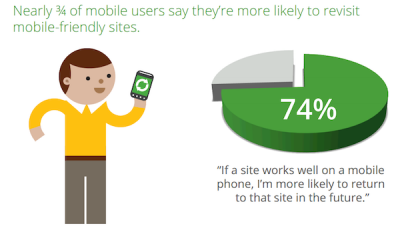 Use Google's Mobile Usability Report to check the status of your site’s mobile friendliness. To check individual pages, you can do the Mobile Friendly Test. If your site comes up short, you can get tips on how to improve your site here. Need advice or help on how to make your site mobile-friendly? Contact us and we’ll be glad to assist you. According to Wikipedia, “information graphics or infographics are graphic visual representations of information, data or knowledge intended to present complex information quickly and clearly.” Simply put, an infographic is a poster-like illustration that’s composed of text, graphics, and color. Some examples of commonly seen infographics include transit maps, weather charts, and graphs that display statistical data like election results. How is Infographics relevant to SEO/SEM? Infographics are generally designed to be linkbait, which is web content that was created specifically to attract attention and to be shared, resulting in inbound links. Since infographics are essentially image files (.jpg), they are easily shareable. A cleverly designed infographic also has the potential to go viral. More links and shares ultimately mean more traffic to your website, which of course drives up your SEO value. Click the image to see the full graphic. It includes a lot of statistics. A google search on infographics also brings up a lot of naysayers who say that infographics is either already dead or will soon fade out of existence. Here’s an example: Infographics Are Dead: Why Your Content Team Should Stop Producing Them. The answer is… neither. Infographics was once the darling of content marketing -- when it was still a novelty. As with all novelties, once the hype caught on, the novelty faded. When infographics were all the rage, any decent infographic had the potential to go viral. Everybody jumped on the bandwagon, which led to an oversaturation of infographics on the web. Too much of anything turns people off. This led to prophecies about its imminent death. But the fact remains, infographics work. If something works, it will survive. As part of a larger content marketing strategy, infographics are still a very effective tool. Instead of abandoning infographics altogether, marketers have become more innovative, creating so-called “interactive” infographics. Take a look at some of the creative infographics from designbysoap, a UK firm that designs infographics. Interactive infographics are fun and… interactive! Search engines love sites that encourage visitor interaction. With interactive infographics you truly have a win-win. The information you wish to convey is in a condensed, easy-to-digest format and presented in a fun interactive package that will (hopefully) wow your site visitors and make them want to share it. Infographics can be a valuable addition to your content marketing strategy. If you feel that your brand’s message can be conveyed through an infographic, go ahead. You can create an infographic yourself using Photoshop or free online tools (just search for “free infographic tools” and you’ll find at least a dozen). However, if you’re not confident in your creative abilities or if you have the budget for it, consider hiring a professional designer. The right infographic, marketed properly, can reap great rewards for your online business. Good communications skills are indispensable in software development. From the point of initial contact with a client to the final delivery of a completed project, it's clear communication that ensures that we understand the requirements and deliver exactly what the client wants. I have some very brilliant engineers on my team, many of whom are not native english speakers. As quick as they are to come up with ingenious solutions to exacting requirements, their biggest challenge is spoken english. Our solution has been to have project managers with excellent communication skills, who speak fluent english and are able to mediate between our clients and our engineers. Native English speakers don't realize how difficult a language English is, to learn. Since it does not use a phonetic script, it is especially difficult to get pronounciations right. Consider the following. The following three words sound different. Non-native english speakers have a tough time pronouncing the variations. Why would you whine about the wine, while the grapes are still on the vine? How about words with different Spelling but same pronounciation? It's not wise to throw a vise at the vice principal but sometimes your vices get the best of you. And how about the same spelling (ch) but different pronounciation? When a Christian goes to Church he/she transforms the sound of ch. Oh, don't get me started on English vowels. How is anyone supposed to learn this language with rules like these? eight - ei sounds like a. I ate at eight o'clock. Some letters get no respect at all. They get ignored. Remember the old riddle about who the silent member of the parliament is? It's I! 'I' is not pronounced. Get it? No wonder why these letters sometimes exact revenge on you for ignoring them by setting you up with rude expressions. Have you considered what happened to the P in the psychology department? That sounded rude, didn't it? It's fertile ground for a vulgar wordsmith when a letter sounds like a verb and a noun all at once. Here's to Mr. Freely from the Simpsons! D'oh! More people access the internet from mobile devices now than from laptop or desktop computers. Over 68% of American adults connect to the internet using smartphones. With more web traffic coming from smart phones and other mobile devices, it makes business sense to create mobile-friendly websites. The prevalent solution until recently was to create separate websites for tablets and smart phones. Managing multiple versions of the same content can be challenging. 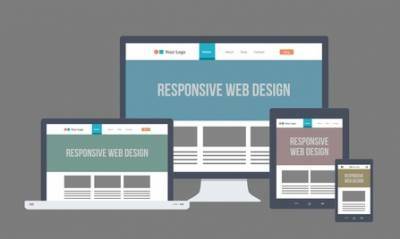 Responsive Web Design (RWD) is an elegant solution to this problem.What is Responsive Web Design?Before we get into what Responsive Design is, let me show you what Responsive Design does. 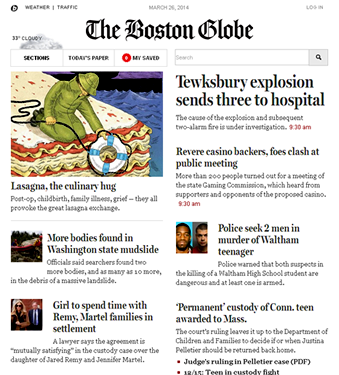 Here is what the Boston Globe website looks like on a desktop computer. Now here is what the same website looks like when viewed on a smart phone. Notice how the header and the navigation bar is automatically rearranged for better viewing on a smaller screen. That is what responsive design is all about. It is about designing a website in such a way that it recognizes the device that each visitor uses to view it and automatically changes the layout for best viewing.Responsive Design Can Save You Time and MoneyWhen web developers first started making websites that render well on smaller devices like smartphones and tablets, the popular solution was to develop multiple versions of a website each designed to render well on a specific screen size. The users would then be redirected to the appropriate version based on their screen size. Maintaining multiple websites like this can be time consuming and expensive. Responsive design requires that you to maintain only one version of a site. The web server changes the layout as needed for the remaining screen sizes by first sensing what the device is that is being used to view the site.SEO Benefits of Responsive Web DesignMaintaining multiple versions of the same site can invite the wrath of search engines that may see both sites as serving duplicate content. There are ways to notify search engines that the multiple versions are being maintained for mobile compatibility. Google, however, recommends RWD as the preferred method of mobile optimizing websites and favors responsive-designed sites when presenting search results.Unlike multiple websites maintained for mobile compatibility, responsive websites use only one homepage URL and one set of pages and files. This makes it easier and simpler for search engines to crawl and index the site content.Another advantage of RWD is that with RWD, all of your internal links and backlinks point to one domain. With multiple sites, each site has a different URL. For instance the mobile site may have a domain like mobile.domain.com. This has negative impact on search engine optimization.Mobile websites can suffer from a high bounce rate if their content is too dissimilar from that on the desktop version of the site. This high bounce rate is interpreted by Google as an indication that a website is not providing relevant information or content the user is looking for, which can result in a drop in ranking. 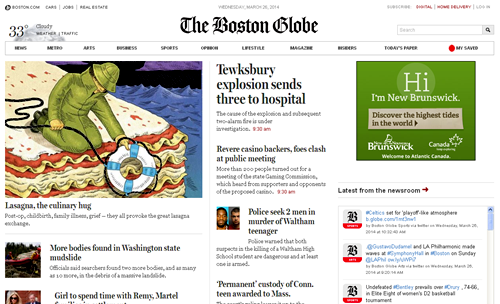 With RWD however, the same content is being served no matter which device is used. Only the layout is changed.Responsive Design Enhances User ExperienceUser-friendly websites make it easier for visitors to find, navigate, understand and share content quickly and easily. Search engines consider user experience as an important criteria in determining search engine ranking. Different devices are operated differently. Whereas on a desktop it is easy to navigate using a mouse or a keyboard, on smart phones the site is navigated using a fingers on a touch screen. The size and positioning of the links determine whether a link that the visitor intended to click is the one that was actually clicked. RWD ensures that the text is large enough to be easily read and links are easy big and separated enough for easy navigation.Limiting scrolling to vertical scrolling also makes it easier to read and enjoy content on a smart phone. RWD can ensure this as well. Ultimately, the goal of a website, as with any other media, is to communicate ideas to visitors in the hope of persuading them to take some sort of action, be it changing their minds about something or buying a product. Poorly rendered message distracts from this goal. Responsive design helps you to connect with your audience, regardless of the device they use to view your site. It achieves this goal while being search engine friendly and cost effective. The new year is here. 2013 saw many changes to the online marketing landscape that presented a whole new set of opportunities and challenges. Are you geared up to avoid the challenges and take full advantage of the new opportunities before you in 2014? Here's what to expect this year and how you can face it with confidence. Content marketing has acquired more urgency as Google implemented search encryption in 2013. This update took away keyword insights which was crucial to search marketing. The safe bet, as always, continues to be in creating articles that your audience finds valuable, regardless of whether they are keyword optimized or not. There is no substitute for good content that not only informs but entertains your audience. Such content helps build trust in you as an authority in your field. 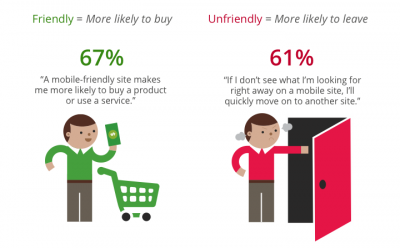 Trust translates to loyalty (repeat visits) and responsiveness (visitors take action that you recommend). What is it that will make your content “relevant”? Content that speaks to the audience's experience, needs, desires etc, delivered in a familiar tone and style makes your content relevant. Don't bore your audience with the same generic style and language that everyone else uses. If you don't have any new information, offer new or interestingly different perspectives on current knowledge. Look for entertainment value even in the most theoretical subjects. Infographics, for instance, reduces complex ideas into graphical representations that make them easier to understand and more compelling. Social media sites like Pinterest, Google +, Tumblr and Instagram have gained popularity as they provide new options in social media marketing. You can now produce engaging content in many more forms of media, enabling you to build your audience across more channels. Businesses and non-profit organizations can branch out and experiment with multiple social media networks. There is no doubt that this diversification builds brand equity. Social media advertising will attract more customers. It will help you make the most of your marketing budget by giving you finer targeting options. Context-specific ads delivered to targeted audiences are outperforming generic advertising by a large margin. Instagram is a social networking service that enables its users to take pictures and videos and share them online.With instagram, you can post cool looking pictures of news about your business instantly and with little effort. Pinterest facilitates users to create and manage events, interests, activities and hobbies which are theme-based collections of images. Browsing other pinboards for images, liking photos or 're-pinning' images to their own pinboards are the features which are beneficial to the users. Google+ has been working on Circles, Events and Hangouts and the intention is to make sharing on the web similar to sharing in real life. Tumblr allows you to share photos, gifts, videos, chats, links and text, view and reply to messages and manage multiple blogs. The advantage of Tumblr is that you can post anything from anywhere. Generally, readers on the net have short attention spans. Heaps of text content tend to bore them. Images help you draw them in and hold their attention. Illustrations, pictures of products, images with emotional content (Kittens, babies, beautiful people, awkward moments), all are more effective and grab attention, so long as they are used appropriately. The success of Buzzfeed and Pinterest is testament to the power of image based content. While search engines give more weight to text-based content, image based content or content that includes images tend to be more persuasive, once visitors get to the page. Complex information can be presented quickly and clearly with information graphics or 'infographics' which are graphic visual representations of data or knowledge. Video content consistently outperforms blogs and other text-based content. A speaking face, voice, emotions and movement all add a psychological component that helps draw audiences to video making videos a very effective marketing tool. Interesting videos get quickly shared across the web enabling you to reach an unpredictably large audience. The power of video can transform the way you communicate with your customers and stakeholders. Video Marketing can be made easier by posting your videos on YouTube and Pinterest. Pinterest is now the fastest growing social network. Pinterest is all about inspiring content and visuals. Pinterest boards now generate more revenue for retailers in comparison to posts on other sites. Find out what problems your target market is struggling with. Explain how you can help solve these problems. Show proof of excellent results you have already delivered. Testimonials can help. Finally, it is important to explain why your customers should choose you over your competitors. Formulate a message that speaks to the problems, fears and preferences. Make it compelling and believable. If you do it right, it will pique your audience's interest in you and what you have to offer. Once you get your marketing message right, use it consistently in all your communications. Mobile search is the starting point. Instead of going directly to a site or app, 82% of shoppers use search engines for browsing product information while in-store. 8 in 10 smartphone shoppers use mobile in-store to help with shopping. Frequent mobile shoppers spend 25% more in-store than people who only occasionally use a mobile phone to help with shopping. These statistics from Google show that even brick and mortar stores are not immune to the influence of smart phones. So, it behooves businesses to be proactive about making their website and other online content mobile-friendly. You may have noticed ads to sites that you have just visited following you to other sites. Some of them even show you the products that you had looked at. This is called Ad Retargeting. This is an effective marketing strategy available with pay-per-click advertising. This technique is effective because only a very low percentage of web traffic converts to a sale on first visit. Ad retargeting works to increase the overall conversion rate by reminding customers of the product or service they viewed. When people interact with and share the content that you create on social media, each such interaction is called a “Social Signal”. Sharing your content on social media sites, posting comments, Likes, tweets, etc are all social signals. Google keeps tabs on how many social signals are generated by your audience. Google then uses this information when determining the relevance and popularity of your content. More relevance and popularity helps your content gain higher position on organic search results. We hope 2014 turns out to be your best year yet with online marketing. As always, we would love to hear from you, if you need professional help with developing and executing your online marketing strategy. You can write to us or call us at 610-856-0011. Researching your competitors: Check out your competitors websites. See what they are doing and use that to gain a competitive advantage. Doing a simple search for the keywords that your customers are likely to search will reveal what they are likely to see. You are in a much better position to compete if you know what you're up against. Marketing by email: Sending out holiday emails to announce promotional offers to loyal customers makes them feel special and reminds them to return. Early bird discounts can encourage people to spend their holiday budget with you before they commit to purchases elsewhere. Following up with emails recommending other products that work well that they have just purchased can lead to additional sales. Search Engine Marketing: Creating a holiday campaign landing page with 'gifts' as keywords will help with search engine rankings. Post holiday specific articles that will be helpful for your potential customers such as how to get the best deals, how to avoid the holiday rush, what the hottest products are this year and so on. Ensure that each article uses the keywords that your customers are likely to search for. Social Media Marketing: Increase your social media efforts by spending time and money to increase your social media presence. Promotions, discounts, gift cards, free gift wrappings, contests and videos are all excellent ways to build a community of fans around your business who will then spread the news to members of their own social network. Loss leaders will drive the people on your social network to visit your site or location. Low cost promo item giveaways with your business contact information will always remind them of you and the excellent service they received by ordering from you. Easy to use website: Optimizing your web site's usability helps to make sure that people you worked so hard to bring to your site will stay on, look around for longer, increasing the likelihood they purchase something. Pay particular attention to the checkout process, especially if you find a high incidence of shopping cart abandonment. Make your site mobile friendly: Launching a mobile-optimized version of your website will ensure that you attract mobile customers. Mobile-optimized websites are able to sense when a visitor is using a smaller screen and change the layout of the site so that it is easier to read and navigate on the smaller screen. This is very important since more are more people go online using smart phones. Include product videos on your site: Shoppers who watch videos of products are more likely to purchase those products. So, interesting videos are not just a way to entertain and inform but also a great way to drive traffic to your site. Free shipping offer: It is a good feature for online shopping and is considered a primary holiday standard and very important service. In many cases free shipping is what makes the difference in where a shopper chooses to buy. Display a shipping calendar: A shipping calendar can let your customers know when a purchase will reach them. This will reduce the customer service time spent assuring customers that their purchase will reach them on time. Clearly post your shipping cut off times on your website let customers will know when the latest time is that they can place an order and still receive it by Christmas. Attracting last minute customers and welcoming returning customers: Help last minute shoppers by providing overnight shipping and other last minute shopping options. Offering daily deals days that go on till the last possible shipping day gives customers who wait till the last minute, ample time to buy from you. 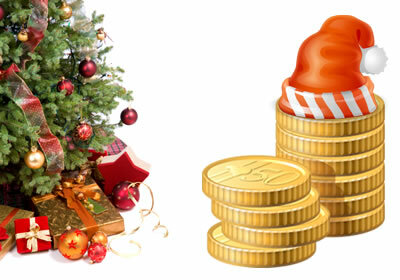 Invest in marketing: Spend more on marketing strategies around the holidays. With every one trying to compete for shoppers who are willing to buy, a well organized marketing strategy can certainly help you stand out. A professional web marketing firm can be your best bet to ensure increased return on investment. Connect with your customers: Its easy to get lost in a sea of businesses competing for attention. Connecting with your customers by making every contact with them a memorable one, from shopping to shipping to customer service can make a world of difference in customers choosing you over others. Provide shopping assistance: Offering a toll free number or live chat can certainly make the shopping experience personal and encourage visitors to buy. Eliminate the perception of risk: Make sure that not only is site secured but also post notices and security certificate emblems to assure customers that your site is safe. Money back guarantees also help drive sales. Last but most effective: Collect customer data, interpret them and learn from your online campaigns to optimize your long-term success. These tips will surely help you on your way to a great holiday sales season. Happy Holidays! With so much content competing for attention on the web, your web pages, blog posts, tweets and other text content can use all the help they can get, to stand out. Images can certainly help. Using images can not only help illustrate the subject matter but also draw attention to your content. Visual interest is, however, not the only reason to use images. With the ability to use search engines to search for images, the images on your web site can be another way to draw visitors to your site. Whenever Google or other search engines crawl your website, they detect the images there and catalog them based on how the images are set up. When someone searches for images relating to a certain subject, the search engine displays the images from many sites as the search results. Along with these search results, they also provide a link to the page that each image comes from. This is how image searches can draw visitors to your site. Even though search engines can detect images on your web pages, they cannot recognize the content within those images. Here are some ways to make this easier. Alt Tag: You can use the 'alt' tag in your HTML code with the description "Photo of The Lincoln Memorial, Washington, D.C., taken on August 12, 2012". Long Description:The Long Description tag allows you to add a more detailed description than is recommended for the alt tag (not more than 50 characters). The tag itself holds only a URL that points to a page that has the actual description. This was originally meant to benefit the visually impaired. However the added content has a positive impact on search engine optimization. File Names: Instead of giving your image files generic names, give them descriptive file names. For instance, instead of img27478.jpg, your photo of the Lincoln Memorial could be named lincoln-memorial.jpg. File Size:How quickly a page loads is one of the many factors considered by search engines in determining what position a page should receive in search engine results. Using images with large file sizes can slow a page down. Saving an image with the dimensions at which it will be displayed on the page, instead of trying to resize a large image using HTML will help considerably. Context:The content before and after an image gives search engines an idea of the context in which the image is used. This helps with cataloging the image appropriately. Keywords: As with any other text on the page, you can use keywords within alt tags, long descriptions, file names, etc. Rules that apply to keywords elsewhere apply here as well. For instance, don't overuse keywords. Use every resource you have to boost your positioning on search engine results. You can start your own blog, use videos, use podcasts - there are so many things that you can do. Images are by far the lowest hanging fruit. Get started with optimizing images and you will be well on your way to obtaining better visibility for your content. I just read a blog post by Wendy Komanchek, a freelance business writer who writes for garden centers, lawncare and landscaping businesses. In her post she talks about whether all businesses should have a blog or not. She concludes that it depends on the type of business. Wendy is right. Not every one needs a blog but most businesses could use one. I have a client whose primary client base is the Amish and Mennonite communities. He sells farming supplies. The Amish and Mennonite don't use the internet. So why would he even need a website, much less search engine optimization or social media marketing. However, during our conversation he mentioned in passing that he is looking to expand his business. This got us talking about how to reach farms outside the Amish and Mennonite communities and how internet marketing can play a key role in opening up that market for him. And blogging is a big part of internet marketing. Build Community and Kindle Conversations - Blogging is a great way to build community and kindle conversation around your business. Your audience may very well share your posts to their own networks. This sharing allows you to reach and build trust with people who you may not otherwise be able to reach and add to your network. Most businesses want that sort of access. Improve Search Engine Positioning - The social networking activity that this sharing generates contributes to your search engine positioning as well. The amount of social networking surrounding the content that you generate provides search engines with an indication of your content's relevance. If it gets shared a lot, they figure it is relevant and bumps up the positioning for that content. And who couldn't use a little help with improving their search engine positioning?Use Fresh Content to Invite Visitors to Return - The general information on most business websites such as mission/vision statements, product/service descriptions, etc remain static. So these don't get shared much. If that is all you have on your site, you are missing out on a lot of potential traffic. This is yet another important reason for most business websites to have a blog. Blogs provide an infusion of fresh content that is vital for businesses to not only stay relevant in the social network universe but also for provides an incentive for general visitors to keep returning to a website. Be Recognized as an Authority in Your Field - A blog can be your main soapbox for disseminating ideas in the marketplace. The more you engage your clients, your potential clients and your industry as a whole in conversations that can start with your blog posting, Facebook posting or tweet, the more likely that you are going to be recognized as an authority in your field. The result is what is being called Permission Marketing or Inbound Marketing. Its a way for your market to come to you rather than trying to reach them through traditional methods such as advertisements, cold calls, etc. So, if you don't have a blog, start one! We're excited to announce our latest website launch - The Law Offices of Nancy K. Busch. 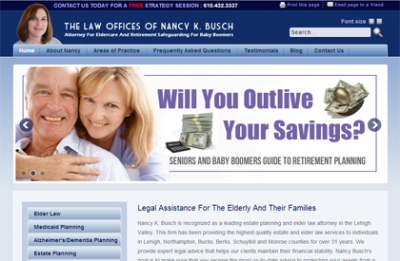 Nancy Busch is an elder law attorney based in Allentown, PA. When we started this project, I was not aware that such a law specialty existed. I have learned a lot since then. With a growing number of baby boomers going into retirement, it is easy to see how important a service it is that Nancy Busch provides. Our task was to create a website that reflects the professionalism and care that Nancy Busch brings to her clients. Through close collaboration with her and her staff, we created a website that is structured to make it easy for visitors to find information. The blue theme adopts the color palette from the stationery and marketing materials that she uses. This provides continuity with a branding strategy that is already in place. The website can be fully managed by Nancy Busch and her staff, without developer assistance, using the content management system that is part of this website. Authorized users can edit existing pages and add new pages easily and securely from virtually anywhere. Besides the general content, the site also offers valuable information for free in ebook format. There is an email marketing strategy in place that is set in motion with the offer of the free ebook. The download link for the ebook is sent only to visitors who provide their name and a valid email address. Visitors who download the ebook are then added to a mailing list with their permission. More valuable information can then be delivered to visitors who are interested, in regular newsletters. Those who are not, can easily unsubscribe. We look forward to working with Nancy Busch to add new features to the site as well as driving more traffic to the site through internet marketing.